Hello all to Google Blogger a.k.a Blogspot user. Do you still using the default subdomain of your blogspot, at myname.blogspot.com? There are many things you can do to make your blog "level up", and the first step is to use your own (custom) domain name on your Google Blogger / Blogspot blog. Using a custom domain means you are using your own purchased domain name, for example myname.com. Of course "myname.com" will be looked more professional to "myname.blogspot.com" right? Not to mention an experienced person will notice that blogspot.com, means it is hosted at Google Blogger which is a free and open blogging service. "Ewww... this blog is hosted at Google Blogger" haha maybe an experienced netizen will think like that. Although this blog is still using the blogspot.com subdomain when this post was first published, but I do already have parked another one of my Blogspot blog to an own or custom domain. I planned to use a custom domain too for this blog soon. I just haven't finished designing this blog yet. After this blog is completely done designed, I will using my own purchased custom domain immediately for this blog to show that I am serious on running this blog. Having our own custom domain name is not a fancy thing these day. We only need to spare about US $10-$15 a year, and we can purchase our own top level domain name, for example myname.com, myname.net, or myname.org. And one of the most popular domain name registrar where I also bought my own top level domain name for another of my Blogspot blog, is Namecheap.com. The name describe the with, Namecheap is trully a place we can buy domain name generally cheaper than any other domain registrars. 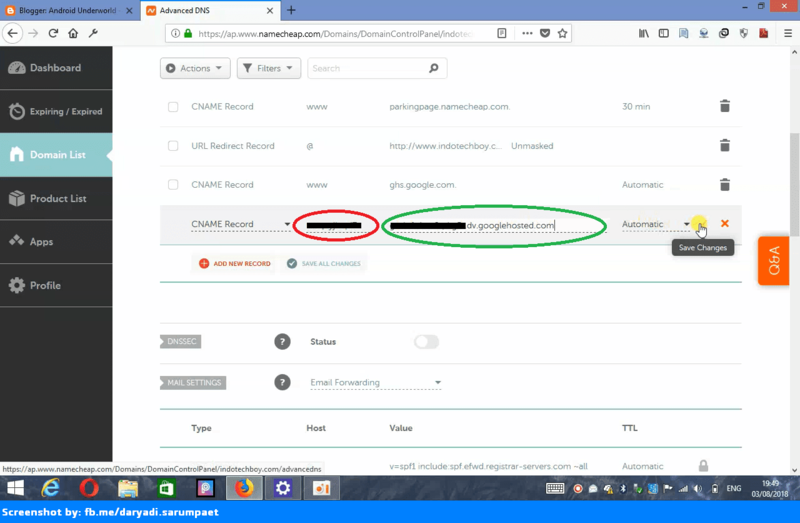 Recently namecheap also give every domain we purchased free lifetime "who-is-guard", it means your identity as the domain name registrant will be keep secret to the public. All right now that you have choose and purchased the domain name you want at Namecheap, the next step is to set it up so it will be redirected and used as your new address for your blog replacing you old blogspot.com subdomain. The process to park our own domain name involving things around managing the Domain Name Server (DNS) setting. First, login to your Blogger / Blogspot dashboard and click on "Settings" section. Then click on "Set up a third-party URL for your blog". In the "The party domain settings" input box, input the domain name you just purchased. Note that Google Blogger / Blogspot does not allow us to use naked domain, means if you are parking a top level domain for example "myname.com", you must add www to the domain, so it become "www.myname.com". After you have typed your domain name in the input box, next click on "Save". Error message when we first input the new domain. An error will appears with some message and information. It's alright, keep the tab opened because we will need some of the information showed after the error message. Click "MANAGE" on your domain at Namecheap dashboard. Open new tab on your browser and login to your Namecheap dashboard. CLick "MANAGE" on the domain you want to park. Next, click on "Advanced DNS". 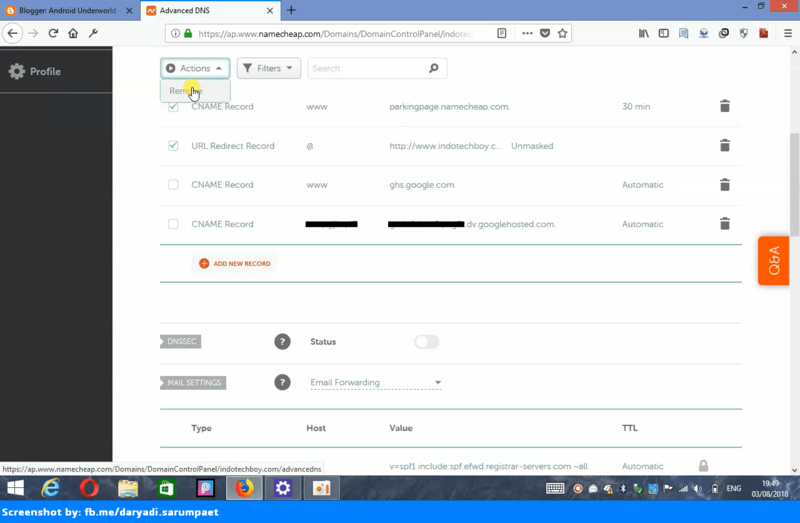 Click on "ADD NEW RECORD" and choose "CNAME Record". Fill the left input ("Host" column) with www. Adding the first cname record. Fill the right input ("Value" column) with ghs.google.com. Click the green check icon to save it. Again, click on "ADD NEW RECORD" and choose "CNAME Record". 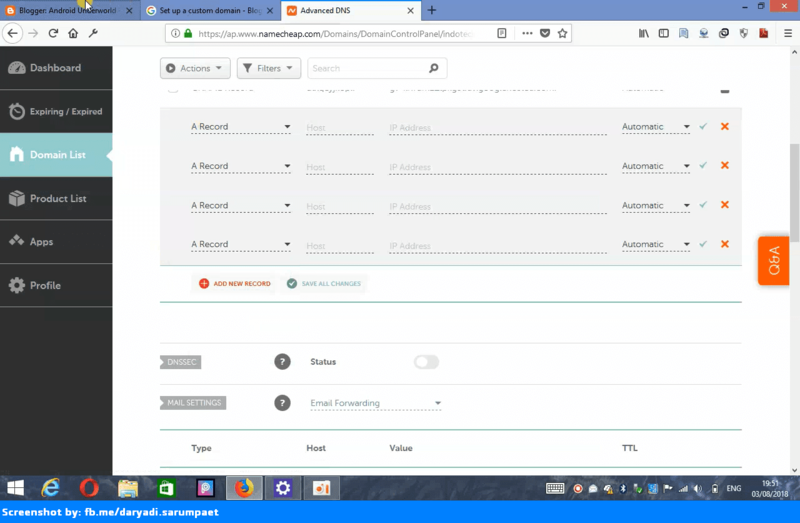 This time, fill the left input ("Host" column) with the code appeared on the second row of the first column on the error message that appeared on the Blogger dashboard earlier. Input the codes appeared on the error message at the Blogger dashboard earlier as the value for the second new CNAME record. Next, fill the right input ("Value" column) with the code appeared on the second row of the second column on the error message that appeared on the Blogger dashboard. Click the green check icon to save it. Now we have 4 rows on the "Advanced DNS" on our Namecheap domain name, first twos are from Namecheap default setting, and the last twos are made by us earlier. 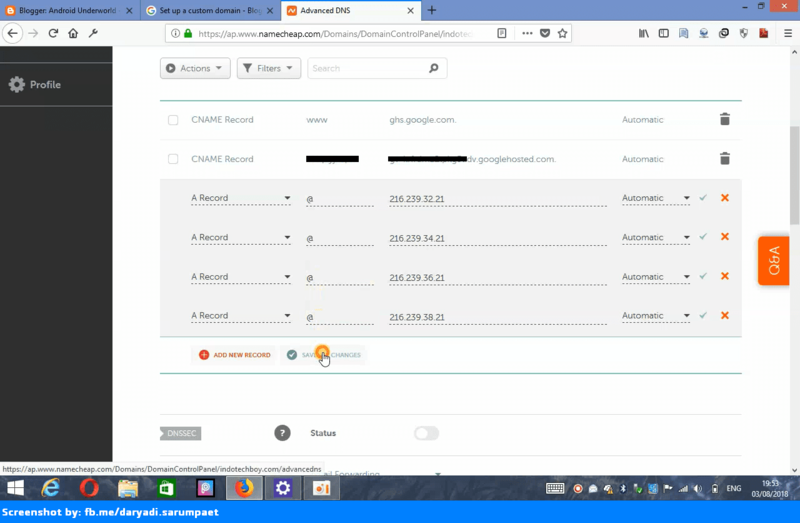 Delete the first two DNS records that come from Namecheap's default. Next is we must delete first twos that came from Namecheap default setting. Check them, then tap on "Actions" -> "Remove". Add new four "A Records". Still on Namecheap "Advanced DNS" page, click on "ADD NEW RECORD" then choose "A Record". Do this four times so we have new four "A Record" type rows. Fill all the "Host" inputs column of the new "A Record" rows with @. After all done, click on "SAVE ALL CHANGES". 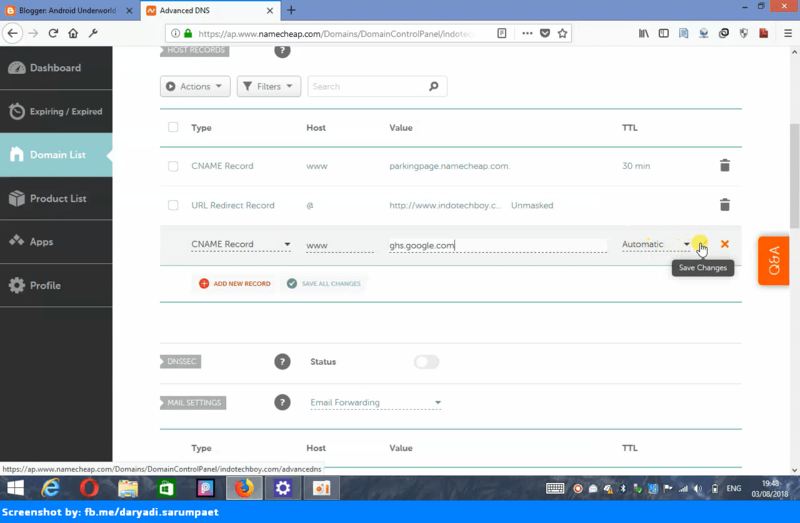 Fill the value of the "A Records" with above Google IPs. Wait at least 30 minutes for the DNS changes to take effect. The final step, input your new domain at your Blogger dahboard and click "Save". Done! Now you should be able to access your Blogger / Blogspot blog with the new domain address, and your old blogspot.com will be redirected to the new domain address. 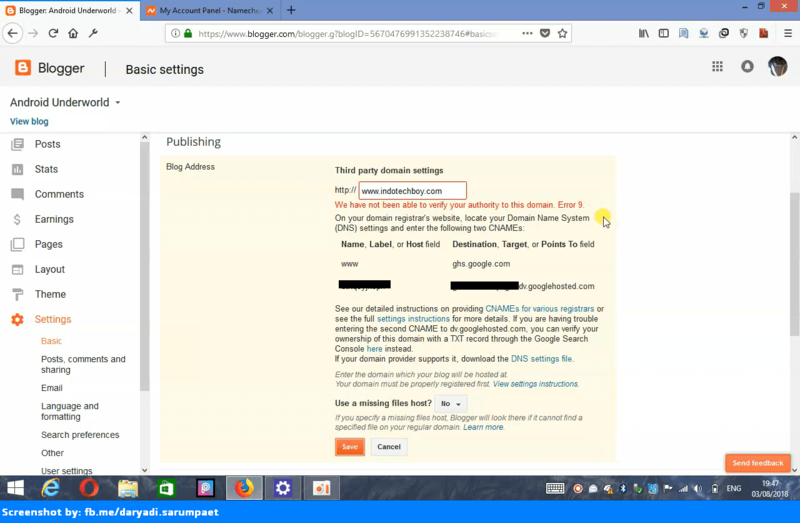 Comments (0) in "How To Setup / Park Your Own Custom Domain from Namecheap to Google Blogger (Blogspot)"